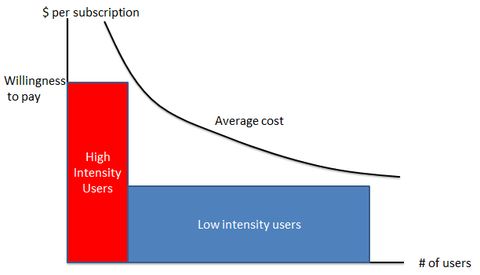 The benefits to high-intensity users would more than compensate for losses on low-intensity users, but there is simply no way for google to capitalize on this, since it can't figure out a way to price discriminate. This is an interesting case where the obvious policy implication seems obviously wrong. The solution when this happens is to simply have the government either provide the service directly, or somehow mandate that private companies provide the service (perhaps with a subsidy to make it profitable). But google products are nothing if not creative, and creativity tends to be something that governments aren't good at encouraging. So I'd say that the demise of google reader is "constrained-efficient"--definitely not the first-best outcome, but not an outcome the government is likely to be able to improve upon.